A friend brought his shotgun today and I was very impressed with how well it was set up. 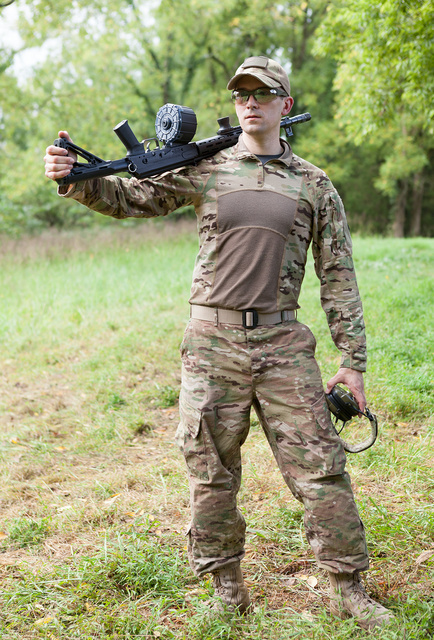 The sight radius is much longer than on the original gun, and ghost ring and circular protective hood around the front post work great for aerial targets. Polychoke gives excellent versatility with slug, buck and bird. Variable length of pull, stubby foregrip and improved pistol grip add up to a handy package. 12-round drum works flawlessly, is easy to load and doesn’t require an awkward support arm position. 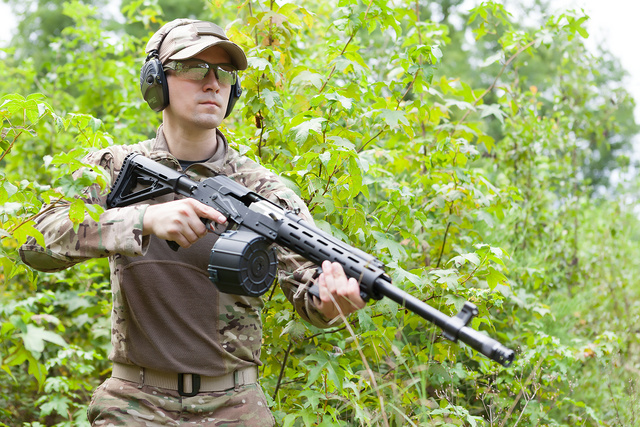 Personally, I like drums for shotguns as they don’t subject plastic shells to much spring pressure, and because this 12-rounder is the same height as a 5-round box magazine. Having a telescoping stock proved most helpful when he got back into armor. The main photo shoot was with Origin 12 shotgun, but it’s great when models bring their own weapons along. I was very impressed shooting the Origin 12. Very low recoil and fast. 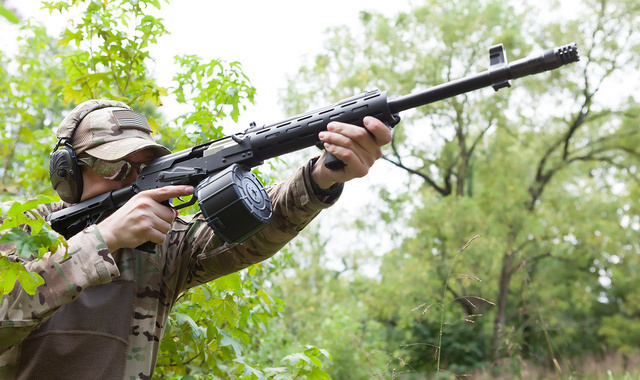 This Saiga is the best balanced and streamlined I have seen. I also like the practicality of the PolyChoke, have been using one on an old 11-48 Sportsman for years. This gun would be wicked on the clays field. What buffer-tube adapter is that? I have a POS one from CAA I need to replace on my Saiga-308. This is the stock adapter from carolinashooterssupply.com. It is aluminum and very sturdy. The only negative in my mind is that it is commercial spec in diameter so not compatible with the stocks on my AR’s.